Tropical Storm Cristobal continued to dump heavy rain on the Bahamas and the Turks & Caicos and Monday as it passed through the region, impacting itineraries of cruise ships deployed in the region. The storm is located 715 miles southwest of Bermuda and is reported to be moving “erratically” north-northeastward with maximum sustained winds of 60 m.p.h. according to the National Hurricane Center. The Bahamas has lifted an earlier issued tropical storm warning. 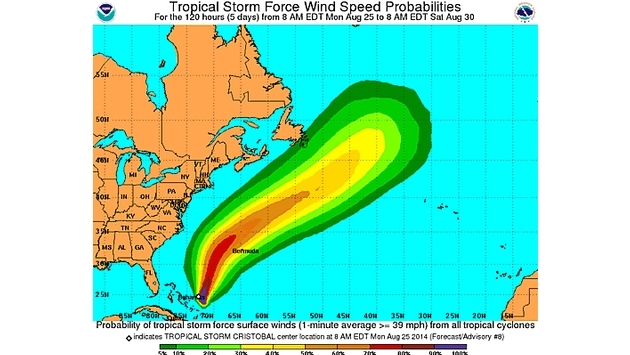 Cristobal is expected to continue moving away from the Bahamas through Tuesday and pass west of Bermuda on Wednesday. The storm led to widespread flooding in Providenciales, the largest and most populated of the Turks and Caicos’ islands, according to local press reports. Workers swept water out of the Providenciales International Airport, which is currently undergoing a major renovation, on Sunday. An American Airlines flight from Miami was cancelled due to the storm, the reports said. 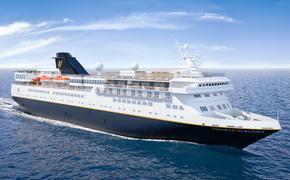 Several cruise lines are altering itineraries as Cristobal passes through the region. Carnival Cruise Lines’ Carnival Splendor will replace a scheduled call at Nassau today with Port Canaveral, Fla. The ship skipped a call at Half Moon Cay, Carnival Corp.’s Bahamian private island, on Sunday, calling instead at Nassau. Carnival had earlier replaced a scheduled Aug. 23 call at the Turks & Caicos’ Grand Turk cruise port with Half Moon Cay. Also, Carnival Pride will replace a scheduled call at Grand Turk with Port Canaveral on Aug. 27, and the ship will visit Nassau instead of Half Moon Cay on Aug. 28. Meanwhile, Carnival Glory spent a day at sea Sunday in lieu of calling in Nassau. Carnival Liberty’s itinerary has been rearranged, with all scheduled ports remaining on the itinerary but in a different sequence. Finally, an earlier announced itinerary change for Carnival’s Sensation has been scrapped and the ship has resumed its normal itinerary. Royal Caribbean Cruises Ltd. announced Freedom of the Seas will not call in at CocoCay, the company’s private Bahamian island today, opting instead to spend the day at sea. The company’s Oasis of the Seas meanwhile skipped a scheduled call at Nassau on Sunday, spending the day at sea as the ship travels to St. Thomas. Meanwhile, should conditions prevent Norwegian Cruise Line's Norwegian Gem from anchoring at the private Bahamian island of Great Stirrup Cay Tuesday, the ship will proceed to Nassau and remain overnight 6 p.m. Wednesday, said a company spokeswoman. Also the company's Norwegian Dawn will depart Bermuda at 6 am Tuesday, while Norwegian Breakaway will modify its Bermuda itinerary, sailing to Port Canaveral Wednesday and will calling at Nassau on August 28. Guests on the Norwegian ships will be kept updated by the captain, the spokeswoman said. Disney Cruise Line’s Disney Fantasy is replacing an Aug. 26 call at St. Maarten with San Juan. The company has not made changes to Disney Dream’s itinerary.